Tea workers and leaders of labor unions in Bangladesh say the revival of the tea industry and rising profits is not improving their lot, as they wrestle with woefully low wages, poor treatment, discrimination, and unfair land rights. They receive an average daily wage of 102 Taka (US$1.22) plus weekly rations of three kilograms of food. "Tea workers' wages are among the lowest in the world," Pankaj Kanda, vice-president of the Bangladesh Tea Workers Union, told ucanews.com. "That's not enough for them to live a decent and dignified life. The cost of daily essentials is rising and tea workers are struggling to keep their health and spirits up," he said. The industry has fallen from its former glory, when it exported tons of tea, but a recent uptick in domestic demand has spelt good news for domestic producers and plantation owners. Experts say the country now produces almost enough tea to cover all of its domestic needs but still has a way to go before the industry is strong enough to compete internationally. In 2018, the nation's 164 tea estates that occupy a total of 111,37000 hectares produced 80.2 million kilograms of tea, the highest amount in recent times. Most are concentrated in the Sylhet, Moulvibazar, Habiganj and Sunamganj districts of Sylhet division, coined Bangladesh's tea plantation hub. Estate owners credit the growth to favorable weather, government assistance to help make better use of tea estates, the installation of modern equipment in factories, and a wage rise for tea laborers last year. According to official statistics, the industry employs 97,000 registered workers and 25,000 irregular or seasonal workers. Activists say the true number of workers in the community, including their families, is closer to 700,000. Meanwhile, those at the grassroots level paint a less rosy picture of this punishing career that is customarily passed down from generation to generation among households. Some say they live in fear of eviction threats and the prospect of being arrested. Kanda is a former tea worker whose grandfather, father and mother were registered workers at the same estate. "I inherited my father's work and my brother got my mother's job," said the practicing Catholic. "A tea worker is entitled to a one-room accommodation, which has become too cramped as our family has grown." "Some of us have managed to build our own houses, but we can't claim ownership of them due to the country's laws on land rights, which don't grant us this entitlement," he noted. Most tea workers are low-caste Hindus or tribal people who were originally brought over by British colonial rulers when they established the first tea estates in Bangladesh in the 1850s. 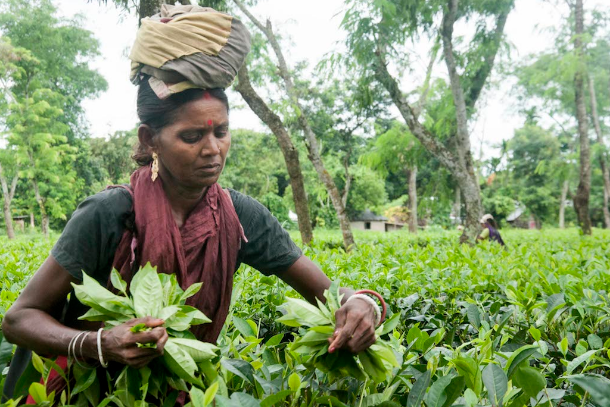 Tea workers are among the most marginalized and discriminated against groups in the country. Many work in conditions some have compared to modern-day slavery. Most live in squalid, mud-walled and thatched-roofed houses. Families are allowed to live there as long as one member works the estate. Most lack the skills and opportunities to seek alternative employment. Despite directives in the labor law, they do not have adequate access to education or health services. "All of the tea estates are supposed to operate schools for the children of their workers, and hospitals to ensure they have access to medical services," Kanda said. "While it's true there are some hospitals, the facilities are inadequate. Moreover, most estates don't set up or run schools," he added. "On paper things look much more rosy, but the reality on the ground is that life is harsh for these laborers." He said their daily wage should not be less than 300 Taka ($3.60), or three times above what most of them receive. "They are supposed to get a pay rise every two years, but often this is delayed and the increment is so small that it barely makes a difference," Kanda said. Low wages, withheld pay, inadequate facilities and abusive treatment often lead to strikes and labor unrest in the industry. Manib Karmaker, 35, a registered worker and a father of two, said his life is full of suffering, like that of many others. "Our wages are low and the facilities we have access to are few and far between," he said. "Our house is not ours because we don't own land. These conditions haven't changed for generations, and they're unlikely to." Those who manage the estates and government officials claim they are committed to improving the workers' welfare. "Tea estates offer good pay and they pay regularly," a senior manager at Finley Tea Company, who asked not to be named, told ucanews.com. "We provide workers with their basic needs and facilities, such as food rations, accommodation and medical services. When one of our workers retires, or becomes unfit to work, we offer the job to one of their relatives," he said. "We admit the facilities might be inadequate, but every two years we sit down with labor leaders and government officials to work out a better salary and improved facilities for them," he added. Nurullah Nuri, secretary of the Bangladesh Tea Board, said the government is sincere about improving their lot. "We are keen to keep the industry moving forward by mediating between the estate owners and workers," he said. "Tea workers earn more now than they did a decade ago, but they still deserve better."